These are also great to watch while eating lunch. Or attempt to eat lunch. Why would you put this show on in a diner anyway? Be cautious about reading World War Z right before bedtime…. Be thankful you don’t have any paramedic friends. We take mealtimes as a challenge. Like last night. Watching National Geographic channel. Untamed Americas was the show. Grizzly bears tearing into and eating great gobbets of rotting whale carcass. At the same time I’m eating my dinner…….hmmmmmm. I always make sure people I meet aren’t Tripod Pilots before I sneeze on them. I took a microbiology class once, and part of the lab was to swab the surface of commonly contacted objects. I’ll never drink from a public water fountain again…. October is the worst time to watch TV prior to going to bed; all those commercials for horror movies coming out. Don’t they know I don’t watch horror movies?!? Probably doesn’t help that the first movie I remember seeing was Gremlins. When I was 3. 5.NOT play homeworld or homeworld 2, those games are awesome. 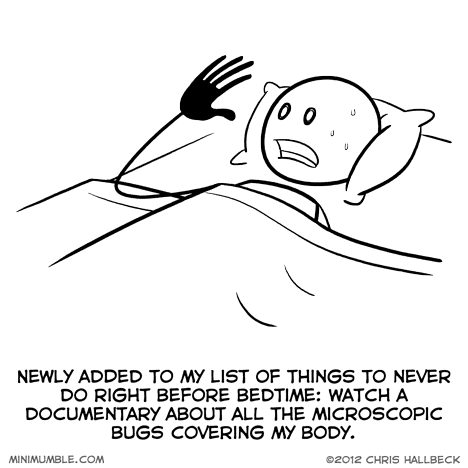 6.write a list of things not to do before bedtime. It’s hilariously appropriate to think that reading this and your other comics before bed is not a good idea, as one can’t simply just read a few. I’ll watch/read whatever I what before bed and before/after meals thank you very much! I have a diamond stomach! P.S. Why do people always say an iron stomach? Don’t they know that your stomach acid would eat right through that?